Most afternoons at the Harrington abode are fairly run-of-the-mill, nothing too exciting. Generally, afternoons involve reading, cooking, baking, watching TV shows or soccer games and taking Lady Annyeong for a walk. But some afternoons get a bit exciting. Take for example the after noon we came home to a carboy of Porter that has managed to ooze out the top through the airlock and is making a bit of mess on the sweatshirt the carboy wears to stay warm, but seems otherwise manageable. 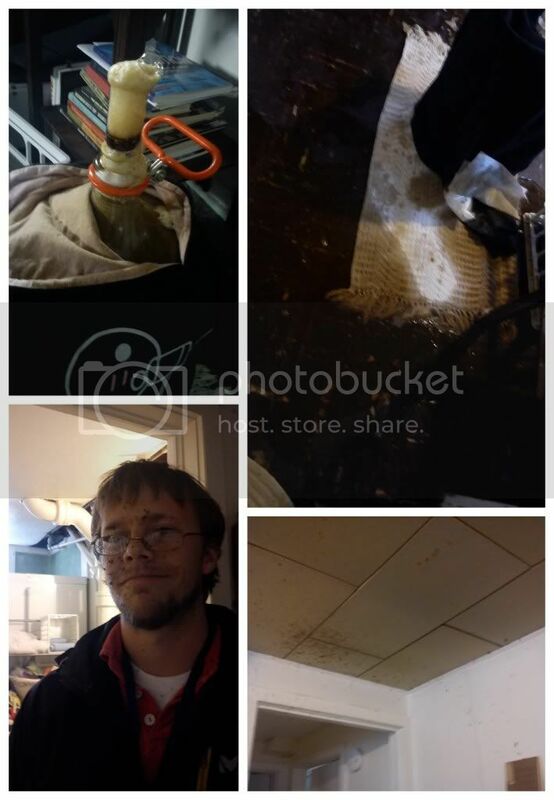 However, within minutes, after a certain man decides to release some pressure to clean out the airlock and get things back in order, you soon realize that beer has sprayed everything from the ceiling to your bedroom door to your man's face and beer is still spilling out the sides of that ornery glass carboy. You think quick, grab a large pot, hold it under the carboy and restrain your laughter while the man is assessing the mess created and how ridiculous brewing beer outside of Korea has become. Soon enough, the man makes his way to the mirror and lets out a soft chuckle realizing how humorous the whole situation is and how unfortunate his face appears when splattered with beer goop. Relieved you let out a fountain of laughter and together you get to work mopping and wiping and cleaning and re-fermenting, thankful that the beer goop actually does come off of the ceiling tiles, so long as you don't scrub too hard. That was awful. Pretty messed up e? Now that'd have took a lot of cleaning.